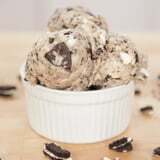 Make This Oreo Cookie Dough in Just 5 Minutes! Cookie dough is having a moment after a new cafe serving a safe-to-eat version popped up in NYC called Do. But if you can't make it to the Big Apple and need to get your hands on edible Cookie Dough now, we've got you covered! To make it even sweeter, we jammed our cookie dough full of Oreo cookies. With a recipe this easy, there's no excuse not to eat this right now! Recipe note: To make this recipe safe to eat, either purchase heat-treated flour or microwave the flour until the internal temperature reaches 160°F. Cream together room-temperature butter, sugar, and vanilla extract until well combined. Add in milk, salt, and flour (half a cup at a time until smooth). Put 10 Oreos into a zipper-sealed plastic bag, crush the Oreos, and set aside. Quarter the remaining 6 Oreos, and set aside. Gently fold crushed Oreos, quartered Oreos, and white chocolate chips into the cookie dough until well incorporated. Enjoy immediately!